The SSH Academy offers an ideal opportunity to recognize individuals whose sustained contributions have had an impact on the field of healthcare simulation. The individuals selected to be the third cohort of Fellows will be honored at IMSH 2019, January 26-29, San Antonio, TX. 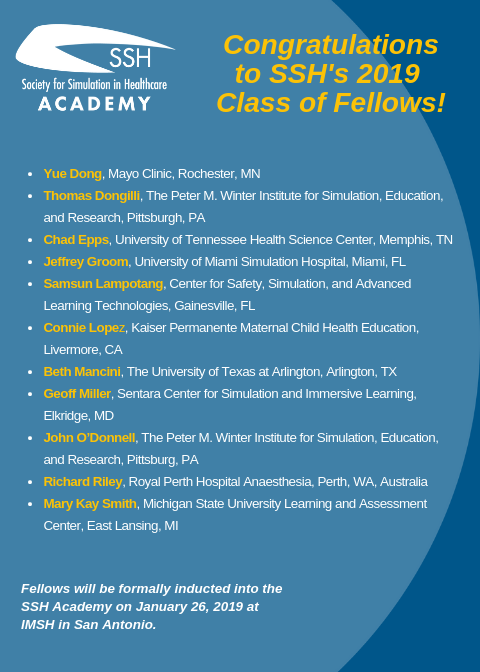 Practitioners, researchers, administrators, clinicians, operations specialists and educators who have built a strong foundation in the discipline of simulation are invited to apply to the Academy as a Fellow. The vision of the Society for Simulation in Healthcare Academy (SSHA) is a world in which simulation is integral to ensuring high quality, safe healthcare. The mission of the Society for Simulation in Healthcare Academy (SSHA) is to recognize and convene a diverse community of SSH thought leaders who harness their collective wisdom and expertise to advocate for excellence in simulation through: nurturing leaders; cultivating the global simulation community; promoting innovation in education, research, and safety in healthcare.